When working with PDF files, one of the most common questions people ask is how to convert PDF to Microsoft Word format. In this article, we’re going to look at some options for conversion. The first option is to use an online converter to create a Word document from your PDF file. Online converters are a perfectly valid choice if you need a quick way to perform a basic conversion from PDF to Word. Uploading a file to a server triggers more general concerns about data security (see the Patriot Act for a good example). The service may not be able to convert password-protected PDFs. Conversion may be slow; some services return the file to you via email, so you could be hanging around awaiting its delivery. You can’t change any options during the conversion. Some PDF layouts may not transition to Word format very well. Most tools won’t allow you to edit scanned PDF content. So while free online converters are handy in a pinch, they may not be suitable for every situation. In particular, if your organisation is not comfortable with storing data in the cloud, online conversion is best avoided. Adobe’s Acrobat product offers a PDF to Word conversion tool in two versions: Acrobat XI Standard and Acrobat XI Pro. Both of these applications are fairly expensive, so if you just want to edit a PDF now and again, purchasing a full product from Adobe is likely to be overkill. So what’s the third option? Do you really need to use Microsoft Word to edit your content? Most people assume that PDFs have to be converted because they can’t be edited, but that’s not the case. You control your data: it doesn’t have to be processed by a third party website for conversion to DOC. Your document won’t be jumbled during the conversion process: it’ll look exactly as you expect. You just open the file, edit and re-save; there’s no time lost for the conversion process, so you can perform an important edit in seconds. Infix PDF Editor’s features are instantly accessible to anyone who’s used Word. There’s barely any learning curve, and the User Guide will help you learn everything you need to know. Infix PDF Editor can edit scanned documents as well as digital content. Infix PDF Editor is also very affordable compared to other PDF editors and PDF to DOC conversions tools. The Pro and Standard versions both offer editing capability. If you only need to use a tool for a one-off PDF editing job, consider using Pay & Save. 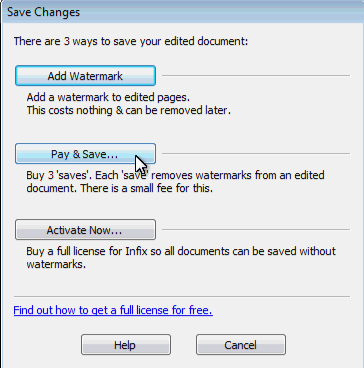 In the free version of Infix PDF Editor, you can pay a one-off fee of £20 to save the final version of your PDF three times. This avoids the need to pay a licence, and you buy the credits right within the application’s Save As dialog. We think Infix PDF Editor is the most convenient and affordable way to edit a PDF. You can do everything you need to do without the need for conversion to DOC format. Give it a try and let us know what you think. Just Awesome! Love your post about converting pdf to word.